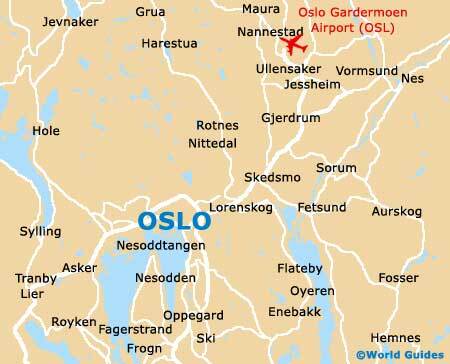 The casual and relaxed Norwegian capital of Oslo is rather different to many cities across Europe. Oslo does not contain endless architectural treasures, although within the historical districts of St. Hanshaugen and Frogner, a number of impressive old buildings offer an undeniable elegance and charm. An extremely popular city with lovers of the open air and the great outdoors, since it lies next to the Skagerrak strait and directly south of the green belt area. Known as the North Woods (Nordmarka), hiking and even seasonal skiing are extremely popular here. When you arrive, visit the tourist information centres at the train station and next to the Radhus (Town Hall), where you will find much tourism advice, the popular 'What's On' magazine and also the Oslo Card, which for many is a good way to sightsee and save money at the same time. With so much for everyone, plan your time carefully during your stay in Oslo, so that you don't overlook anything or run out of time. Make the most of the Norwegian summer by visiting one of the city's many beaches in the peninsula of Bygdoy area, or take a stroll around the acclaimed Vigeland Sculpture Park. However, if you arrive during the winter months, you may wish to try your hand at cross-country skiing around the Nordmarka woodlands, or head on down to the Holmenkollen Ski Jump and watch one of the regular championships. 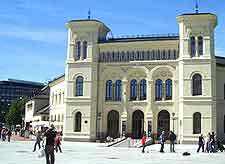 A recent addition to Oslo is the Nobel Peace Centre, added since this is the city where the Nobel Peace Prize is presented each December. More information about Oslo Tourist Attractions. This capital city is rightly home to a wealth of Norway's very finest buildings. 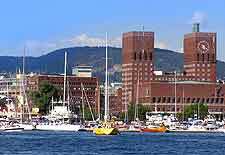 These include the Oslo Domkirke (Cathedral), the Akershus Castle and Fortress, and the Parliament Building, which is best known in Norway as the Stortinget and opened in 1866. Also look out for the Trefoldighetskirken church in the central Karl Johans Gate area, and close by the Town Hall, which was built in the middle of the 20th century as part of Oslo's extensive 900th anniversary celebrations. 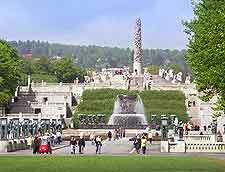 More information about Oslo Landmarks. Allow yourself to be immersed in the city's past and learn much historic information at the Oslo Bymuseet museum, or spend an hour or two at the world's oldest ski museum, the Skimuseet i Holmenkollen. Remembering the Nordic roots of Oslo, the Viking Ship Museum (Vikingskiphuset) proudly exhibits its 900-year-old Oseberg ship, while for galleries, the National Museum of Contemporary Art and the National Art Gallery are amongst the best, where Munch's world-famous 'The Scream' painting is on exhibit. More information about Oslo Museums and Oslo Art Galleries. 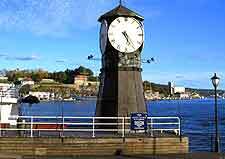 Many popular day trips present themselves to those wishing to explore a little more of Norway. The beachfront at the neighbouring village of Drobak is a definite highlight, as are the ski resorts of nearby Lillehammer. If it is thrills that you are after, then the TusenFryd Amusement Park is less than 30 minutes away and contains a number of thrilling roller coaster rides. More information about Oslo Attractions Nearby.